Originally published under the title, "Turkey's Thugocracy." Hurriyet columnist Ahmet Hakan (left) and the men who brutally beat him last week (right) shortly before all but one were released. In 1908, the Committee of Union and Progress (CUP) took control of the Ottoman Empire and became increasingly autocratic, openly threatening its critics, especially journalists. In 1910, three prominent journalists who were leading opponents of the regime—Hasan Fehmi, Ahmet Samim, and Zeki Bey—were murdered. Several other journalists were beaten by thugs commissioned by the CUP. When the CUP's parliamentary majority eroded due to defections and by-elections, its leaders called for new elections in 1912 and dispatched baton-wielding thugs to intimidate voters. As a result, the CUP won 269 of 275 seats. Victory, however, did not bring good fortune to the party. Its leaders would eventually have to flee the country. More than a century later, in 2015, Turkey's new autocratic regime, the ruling Justice and Development Party (AKP), lost its parliamentary majority for the first time since it came to power in 2002. Turkey's President Recep Tayyip Erdogan practically declared the polls null and void and called for new elections to take place on November 1. And just as in 1908-1912, journalists are at the center of the government's rage. At left, Turkish MP Abdurrahim Boynukalin of the ruling AKP leads a mob in front of the offices of Hurriyet newspaper on September 6. At right, the shattered windows of the building's lobby after the mob hurled stones. 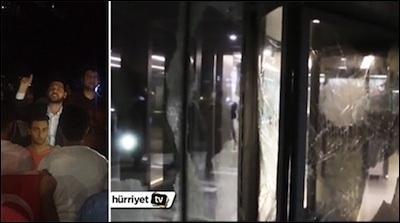 On September 6 and 8, 2015, the offices and printing works of Turkey's biggest daily, Hurriyet, were pelted with stones by hundreds of club-wielding fans of Erdogan. Video footage from the September 6 attack shows a Member of Parliament from the governing AKP Party, Abdurrahim Boynukalin, leading the mob. In a fierce speech in front of the newspaper's building, Boynukalin vowed that the Dogan media company [which owns Hurriyet] will "get the hell out of Turkey" when Erdogan will have additional executive powers "whatever the electoral outcome on November 1 will be." Other video footage showed Boynukalin speaking to the same mob that attacked Hurriyet. Referring to Hurriyet columnist Ahmet Hakan and Hurriyet's editor-in-chief, Sedat Ergin, Boynukalin said, "They had never had a beating before. Our mistake was that we never beat them in the past. If we had beaten them..."
Pro-AKP vigilantism is increasingly popular among the party's thuggish Islamist loyalists. Well, last week, Hakan was beaten by four men, three of whom happened to be AKP members. The popular columnist, who has 3.6 million followers on Twitter, had to undergo surgery for his broken nose and ribs. 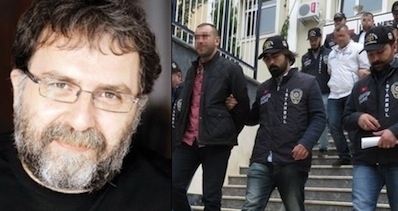 Members of the group confessed to the police that they had been commissioned by a former police officer to beat Hakan on orders from important men in the state establishment, including the intelligence agency and "the chief." Of the seven men involved in plotting and carrying out the attack on Hakan, six were immediately released. It remains a mystery who "the chief" is. It is highly unlikely that police will find any evidence that the attack was ordered by the AKP or by any of its senior members. Nor will any police or intelligence officer be indicted for ordering it. Since the beginning of the 20th century, Turkey has seen a collapsed empire, the birth of a modern state, a one-party administration, multi-party electoral system, several elections, three military coups, civil strife along political and ethnic lines, oppression by one ideology or another, and dozens of political leaders. But one feature of Turkey's political culture persistently remains: Violence. President Erdogan is probably not too unhappy. He may think that the deeper the political polarization, the stronger his loyalists will feel attached to him. Hundreds of Turkish and Western politicians have publicly condemned the attack on Hakan. Except Erdogan. Hardly surprising.